All Size Flooring Center & Carpet Cleaning: How Do You Know What Flooring to Buy? How Do You Know What Flooring to Buy? Building or renovating a house is a project filled with so many choices that it can be overwhelming. While it is great to have options, narrow them down to the one choice that is best for you. Here are some tips for choosing the right flooring. Whether you are choosing flooring for one room or the whole house, you will want to consider the size of the space. Smaller spaces look larger when the same material is used throughout. This trick draws your eye from one room to another with no breaks. Texture also affects the visual size of a space. A room with a plush carpet will appear smaller than the same room with a smooth solid surface like tile or wood. If the space is too large, you can break it up with different materials so it appears cozier. You might choose hardwood for a large room but then add an accent rug in the sitting area. Layering can create added warmth in a cavernous space. Your choice will not change the size of your room, but the right material can change the visual space. Another thing to consider when making a flooring choice is how the room is going to be used. A space right inside the door will likely get more traffic than a room upstairs. You will want to put more durable materials in the high-traffic areas of the house. Although stain-resistance in carpets has improved dramatically in the last ten years, hard surfaces remain the easiest to clean. Most tile and wood products can be made impervious to moisture thanks to revolutionary finishes. A good old-fashioned mopping will keep these surfaces looking new. If you are set on carpet, tight weave and commercial grade carpets are designed to withstand a lot of traffic. They will not wear out as quickly as a plush carpet and are easier to clean. In large commercial spaces, carpet squares are used so stains or wear marks can be removed easily. Replacing one square of carpet is much cheaper than replacing the whole room. This may be a concept you want to look into if you choose to put carpet in a high traffic area. 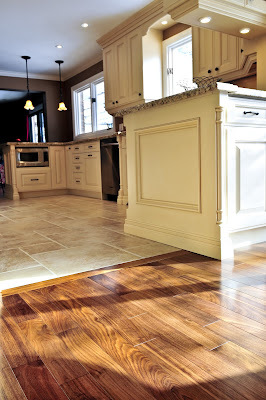 The style and age of your home will influence the flooring you choose. Using synthetic materials in older houses can sometimes compete with the architecture. However, sometimes new materials present a more efficient option. New manufactured wood products, for example, offer the traditional look of wood without the expense and mess of installation. Considering the size, use, and look for your rooms will help narrow down flooring options. You may want to rely on the experts at your local carpet center for some suggestions. When considering flooring, Yardley, PA residents visit Angelo's Carpet One Floor & Home. Learn more about this procedure at http://www.angeloscarpetonelevittown.com/.